Can I study without a training partner? HELP! I don’t have a training partner! …is a very common question. The answer is a clear cut: Yesnosortof. There is a lot you can do by yourself. I’ll talk about that in a minute. But first, Having a training partner is very important. There are a lot of skills you simply cannot build without one and a lot more that are much faster and easier to build when you have someone to work with. The key to finding a good training partner is to start looking and never stop. Just like your kung fu practice. Put a little time into it every day. There are all kinds of online tools you can use. Meetup, Craigslist, etc… Don’t forget about offline tools either. Community bulletin boards and stuff. Don’t get discouraged when no one shows up on the first day, or week. Just make this search part of your ongoing practice. …and don’t stop just because you have 1 or 2 or even 10 training partners. A few more is always a good thing. 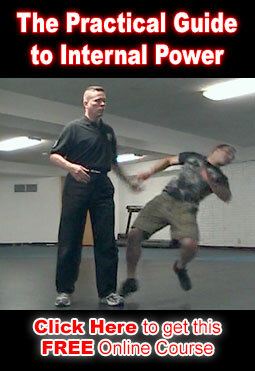 While you’re working on that the Internal Iron Body DVD is an excellent way to build power and internal iron. And you can work on it every day all by yourself.